Hey Hey time for another restaurant review! 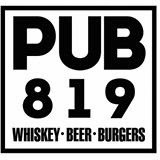 For Christmas my Brother & Sister in-law gave us a gift certificate for a new place called Pub 819 Whiskey-Beer-Burgers. We never go to the city of Hopkins, we really liked their downtown. Lots of little shops and places to get a drink or a bite to eat. 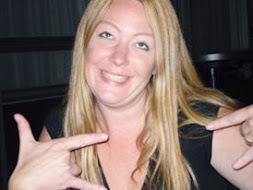 This was a Friday night, usually the night we go out, This place was hoppin! It was going to be an hour wait, oh lordy don't make mama wait too long for a beer I was thirsty! But luckily we got a spot at the bar within 5 minutes (seat yourself). I'm not sure if there were lots of bartenders or if the servers (my daughter said they don't want to be called waitress) were back behind the bar but it was busy. The bartender who help us out the most, was super nice and really informative and we never had to wait for anything she was on the ball (and she had fun purple hair)! Marc (that is the hubbie's name) and I wanted the same burger (I wish I could only order a half a burger, I can never finish them). We went for the Blue Burger , that is made with blueberries, arugula, purple onions and blue cheese I'm pretty sure that it was on an egg bun. If I were to change anything it would be to stuff the burger with cream cheese and 1/2 the amount of blueberries, it was just too tart of a flavor, made me pucker! Otherwise I really like the flavor combo. 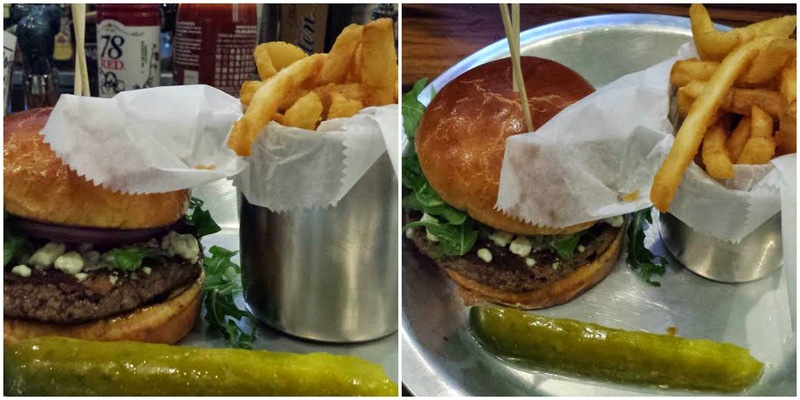 The burgers came with their homemade fries, really good and fancy ketchup! Marc had me take note of what it was so we can see if we can get it at the store. You can see it behind the burger on the left. Fancy Ketchup 78. Now on to the Beer! Sitting at the bar we got an excellent view of all the beers and whiskeys, an awesome display I may say. I had a Excelsior Big Island Blonde Ale, that was SO good! Husband had a Fulton Ringer and a sample of the Badger Hill - MSB, Strong Bitter. With all those whiskey bottle staring him in the face you know he had to buy a bottle, it was a special 1 barrel brewed especially for Pub 819 by Cody Road, pretty fancy! I would give this place another visit! Hope you decide to visit them too! Glad you were able to make it out there. Hopefully we can make it there sometime!